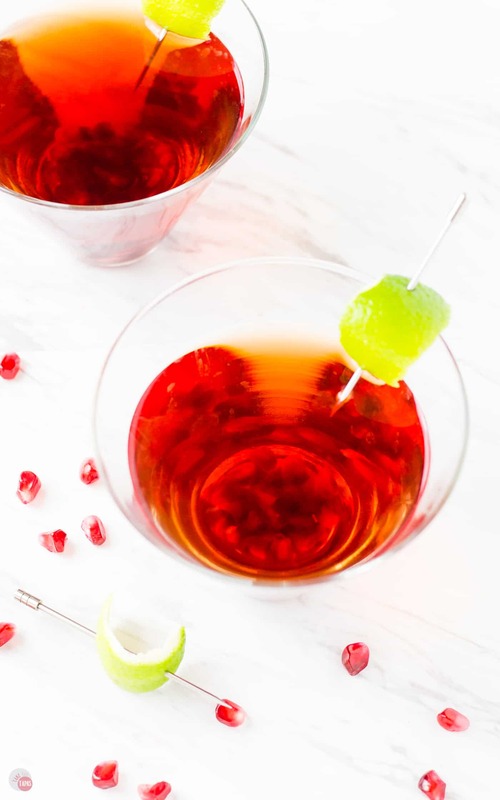 Pomegranate Gimlet - A Tart Holiday Gin Cocktail for Parties! Do you love gin and need a new cocktail for the holidays? 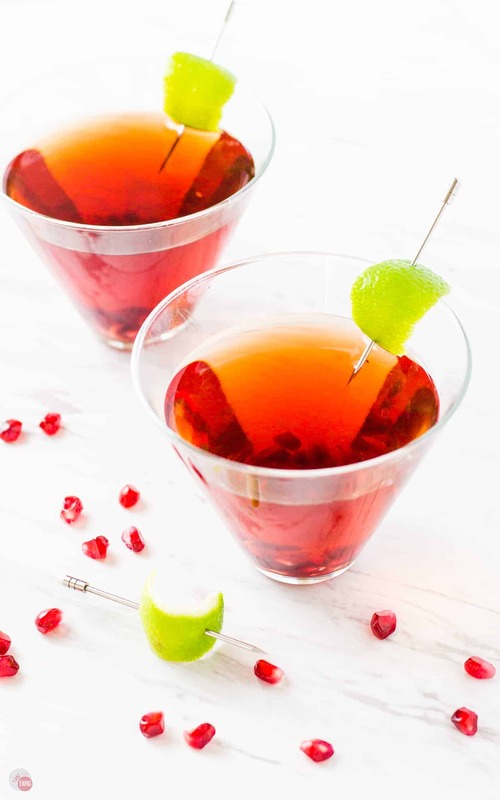 Check out my Pomegranate Gimlet that you can enjoy all season long! I have never been a gin drinker but I do love spreading my wings and trying new things like this Pomegranate Gimlet. I have a few pomegranates lying around so let’s have some fun, and make a mess while we are at it. What are you drinking this holiday season? I am enjoying some forbidden fruit on my cheese boards and in my cocktails. I am talking about pomegranates if you weren’t sure what I was talking about with regards to forbidden fruit. Some say a pomegranate is THE fruit that Eve took a bite of and ruined all of mankind. Pomegranates may or may not be the forbidden fruit but I don’t care because I love them in this Pomegranate Gimlet. I still haven’t mastered peeling one and getting all those tasty arils out without looking like I stepped off the set of a horror movie so now I just wear black while doing it. One time I got lucky and found some dark chocolate covered dried pomegranate arils and for the life of me, I can’t seem to remember where I got them. I really want more of them because I inhaled the first bag in one sitting and it wasn’t a tiny bag I am embarrassed to admit. I’ll just keep looking. If you happen to know where to get find some, shoot me a comment or an email! On to the Pomegranate Gimlet! 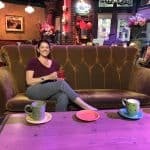 My friend Chrissy is going to love this cocktail. Chrissy loves Gin because of its herbaceous flavor. Cilantro is one of her favorite herbs so it’s no wonder that she loves it so. I pseudo-like gin now so mixing it with something I love warms me up to it a little faster. Bourbon isn’t my favorite but it is growing on me too, I just need someone to help me learn to appreciate it. Chrissy helps me to appreciate gin, so my Pomegranate Gimlet is for her. A traditional gimlet is made with just two ingredients: gin and sweetened lime juice. The actual Gimlet recipe is 2.5 parts gin and 1 part sweetened lime juice. I start with the original recipe, as I do with all “classic” cocktails and tweak them to my palate. Customizing the recipe to my liking is probably the best part of making my own drinks, that and its a lot cheaper than sitting at a bar. So for this pomegranate gimlet, I start with the 1 part of sweetened lime juice and add 2 parts gin. Upping the sweetened lime juice helps balance out the strong flavor of the gin and also makes it mix better with the tart pomegranate juice. Addin 1.5 parts of pomegranate juice is the perfect amount, for my palate, but feel free to start with 1 part pomegranate juice and then taste. If you prefer the flavors of the gin more forward then stop here. If not, up the pomegranate juice to the 1.5 and then taste again. Some days I like equal parts gin, pomegranate juice, and sweetened lime juice. See, make it how you like it!! Once you get the proportions just the way you like them, add some ice and shake it to chill it down quickly. I don’t know about you but I don’t keep my gin in the fridge so I need to cool my cocktail down. Strain out the ice and pour into a martini glass. Garnish with a lime slice or wedge, and some pomegranate arils. You can buy the pomegranate juice already prepared (Thanks, POM Wonderful) and my grocer has packages of pomegranate arils already removed in the produce section if you don’t want to peel your own. If you are going to peel your own pomegranate let me tell you how I do mine. I start by cutting off the top and bottom of the pomegranate and then scoring the sides a few times from top to bottom and then breaking it into four parts. Fill a deep bowl with water and add the pomegranate sections to the water. While holding a section submerged under the water, gently start to pop the arils off of the membranes. Some will pop open but most won’t and the ones that do pop open will be submerged under water so they won’t spray their highly staining red juice all over you. You can do the technique where you slap your pomegranate with a wooden spoon but I always hit my fingers with it so I use the water method. Once I get all the arils popped off, I remove all the membranes and skins from the bowl and then strain off the water leaving nothing but arils. Store them in a ziptop bag in the refrigerator until ready to use in your Pomegranate Gimlet, or any other recipes you might use them for. I like to eat them all by themselves and they are great in guacamole! Do gimlet glasses exist? I am sure that there are some out there but I don’t have time to have a specific glass for every type of cocktail out there. Not only don’t I have the time, I don’t have the storage for the glassware nor the cash to actually buy them. My bar consists of wine glasses with stems but mostly stemless, highball glasses, stemless martini glasses, and some “bobo” tumblers I got from Target. Oh, and these Spanish recycled glasses that you see a lot of my cocktails in. I found mine at TJMaxx and love the weight of them. Don’t stress over glassware when you drink your pomegranate gimlet, just enjoy it. It even tastes great out of a plastic cup! 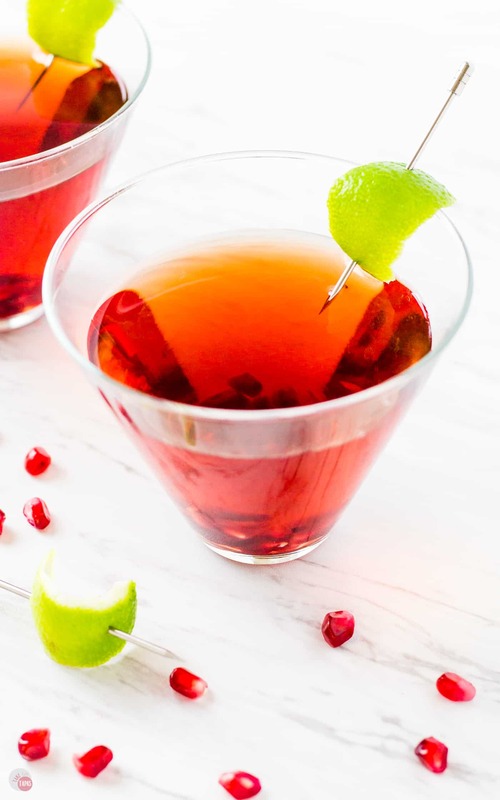 Combine the pomegranate juice, gin, and sweetened lime juice in a cocktail shaker. Add a few ice cubes to the shaker. Shake to combine the ingredients. Strain into two martini glasses. Add a lime slice and pomegranate arils for garnish. *I like to use Rose’s Brand Sweetened Lime Juice but you can always make your own from scratch. If you like your Gilmet on the tart side, you can remove the sweetened lime juice and just add lime juice without sugar.